Thirty years after Voivod initially roared into our world, the group returns with a quick gift for fans: A six-song collection that gives us two tracks previously issued only on vinyl via split releases with At the Gates and Napalm Death, two new tracks and a cover of Hawkwind’s “Silver Machine”. As you listening to this you come to the realization that you’ve never wanted a new Voivod album more. The opening “Post Society” and its follow-up “Forever Mountain” are exciting preambles to this collection’s third and maybe most exhilarating track, “Fall”. It’s there, in those pulsing grooves, that we become sold on the idea that this group has never been so vital, focused, committed. Away has always beat his drums with an alien abandon but now there’s greater technical precision than before and the rhythms themselves have a tighter grip on what we call reality. Vocalist Snake has lost nothing over the decades and his post-apocalyptic yawp remains as frightening and unique today as it was in the early 1980s. Guitarist Chewy gives us the imaginative barbed rhythms and lead lines we’ve come to expect from a Voivod record, then explodes them with even more imagination and visceral power. Perhaps it’s ironic or perhaps it’s not that a band so idiosyncratic, so singular has always excelled at cover tunes but the take on “Silver Machine” here is as good as anything of the originals, a kind of sonic remnant of the future from which these four aliens have come from to enhance our less evolved lives. Voivod is, mercifully, working on new material and rumor has it we will hear some of that later in 2016. We can only hope. 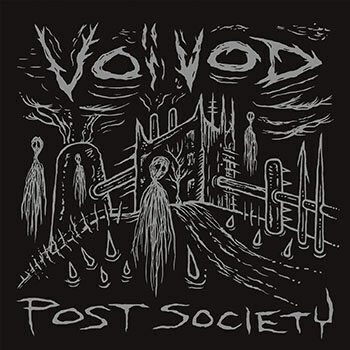 The world has never needed Voivod as bad as it does now.